At least four persons were on Wednesday killed and seven others injured after a pole fell on a stationary commercial bus in Lagos. The incident occurred at about 8:00 a.m. at Ilasa, along the Oshodi-Apapa Expressway. Among the deceased was one Odejayi Adebola, who is said to be in his 30s. The Nation gathered that a truck heading towards Oshodi and on top speed developed mechanical faults and rammed into the pole. Consequently, the pole fell on the commercial bus and killed four people on the spot. An eyewitness, Eze Adiguo, said at least 20 persons were injured and eight escaped unhurt. He said: “The accident occurred at about 8:00 a.m. A bus parked off the road and was loading passengers. Suddenly, a tipper on high speed coming from Cele axis just rammed into a signpost. When the tipper hit the pole, the pole fell on the bus and four people were killed. 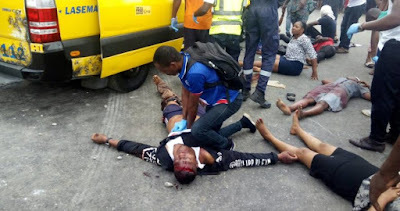 “Policemen from Ilasa Division and officials of the Lagos State Emergency Management Agency (LASEMA) arrived the scene and evacuated the injured to the hospital. However, the General Manager LASEMA, Adesina Tiamiyu, said three persons died in the accident, adding that seven people sustained injuries. He said: “The LASEMA Response Team (LRT) received a distress call through the emergency toll free line at 8:26 a.m. They were told of an accident by Ilasamaja inward Oshodi and deployment was made to the scene. “Preliminary investigation carried out by the LRT at the scene of the incident revealed that an empty lorry (iveco) with registration number MEK695XA hit an overhead signpost which subsequently fell on a commercial coaster bus coming from behind. “Seven adult victims comprising four females and three males were rescued but they had severe injuries. They were stabilized by the LRT and subsequently transfered to Mushin General Hospital for further treatment. “Three adult males lost their lives and were later handed over to officials of the State Environmental Health Monitoring Unit (SEHMU) to be transferred to the mortuary.